Fujifilm has completed its premium X Series refresh with the announcement of the X-E3. 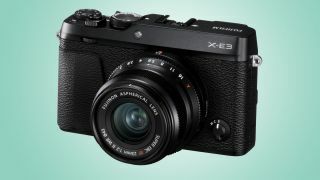 The ageing X-E2S has been the odd one out in Fujifilm's mirrorless range for a while now, still soldiering on with the 16MP chip, so it's no surprise to see the X-E3 getting the company's 24.3MP X-Trans CMOS III APS-C sensor, falling in line with the rest of the range. The 24.3MP chip has already impressed us in the likes of the X-T2, X-T20, X-Pro2 and X100F. So what else is new? First up is the upgraded display. Screen size and resolution remain the same at three inches and 1.04 million dots, but the X-E3 gets the most integrated touchscreen control we've seen on an X Series camera. This includes the ability to move the focus point to the chosen position, and optionally trigger the shutter, by tapping the screen, while playback controls include swiping through images, double-tapping to enlarge images and pinch-to-zoom. There's also a new 'Touch Function' feature, which enables you to use up/down and right/ left flicking motions to call up pre-assigned functions. The X-E3 is the first Fujifilm X Series camera to offer Bluetooth low-energy wireless communication, enabling you to pair it with your smartphone or tablet to easily transfer pictures using minimal power. Autofocus has also been overhauled, with the X-E3 sporting an updated algorithm to deliver a fast AF speed of 0.06 seconds – we're guessing with the same 77 AF point arrangement as the X-E2S, although this hasn’t been confirmed. Fujifilm also claims the X-E3 is also able to lock onto moving subjects twice as fast as previous models thanks to a newly developed image recognition algorithm. As we've seen with both the X-Pro2 and X-T2, the X-E3 gets a dedicated Focus Lever on the rear of the camera, allowing you to quickly change the focus area while keeping an eye on the viewfinder. The X-E3 can record 4K video (3840 x 2160) at up to 30p for 10 minutes, while Full HD recording is possible at up to 60p for up to 15 minutes. You'll also be able to record video using the array of Film Simulation modes the X-E3 features, while you can output recorded video to an external monitor, via the HDMI port, and input audio via an external microphone. The design has been refined, but retains the same built-in 2.36 million-dot EVF. Along the top plate, the milled aluminium exposure compensation mode dial now has the C position to enable exposure compensation of up to ±5 stops in 1/3 steps. The X-E3 is also equipped with an Auto mode selector lever for selecting the fully-automatic Advanced SR Auto mode, in which the camera chooses the optimum settings for a given scene. The X-E3 will be available later this month with a body-only price of £849, or as a kit with the 23mm f/2 lens for £1,149 or the 18-55mm f/2.8-4 for £1,249 in the UK. In Australia, the camera will hit retailers on September 28, and the X-E3 with the 23mm f/2 kit lens will carry a price tag of AU$1,799. US pricing is to be confirmed.